This is another one of those food photos that I took a while ago and haven’t blogged until now, as you might be able to tell, since these are CHRISTMAS cookies – hah! Below is the Jello Cookies recipe so you can play along at home! Oh, and I used a little extra jello powder instead of colored sugar on top of the cookies to give them a bit of darker accent color. Mix flour with baking powder and set aside. Cream oleo, gradually add sugar and jello, beating well. Beat in egg and vanilla. Gradually add flour mixture, mixing well. Force dough through cookie press (or make cut outs) onto ungreased baking sheets. Sprinkle with additional jello or colored sugars, decorate if desired. Makes about 10 doz (from press only). Bake at 400 degrees about 8 minutes or until sides are golden brown. 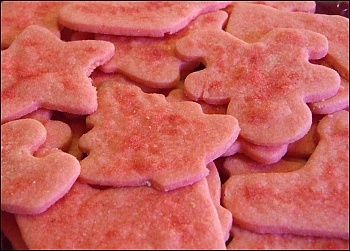 Note: This makes an excellent alternative for regular sugar cookies, both in color and flavor. Use orange jello mix for Halloween cookies, etc.